I seem to know a lot of tall guys. Poor guys, can't find shirts or suit jackets that fit in the shoulders and chest AND are long enough for their gorilla arms. Poor seamstresses (me), having to alter the tall guys' sleeve lengths and mess with those awful mitered vents. I will answer a couple major questions here. 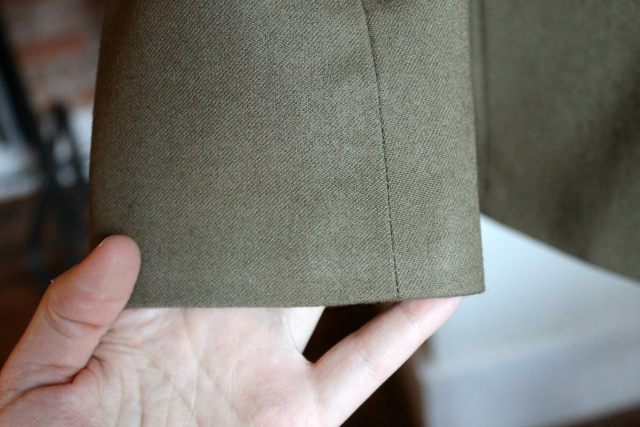 Can you lengthen a suit jacket sleeve? Despite the sad lack of internet tutorials on how to do so, YES, you can. In this case I lengthened the jacket sleeves by 1-1/4" and added a facing so I would have enough fabric to recreate the sleeve vent. 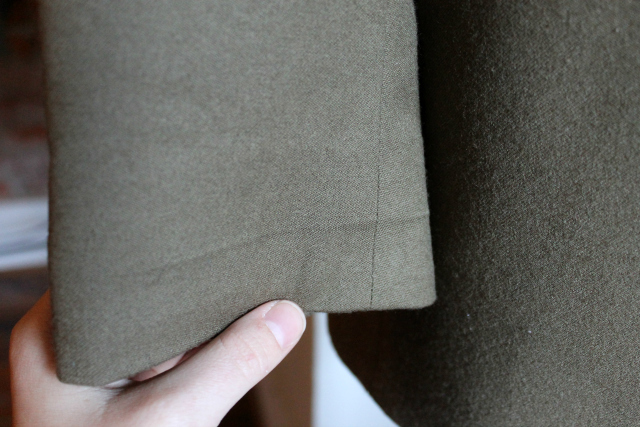 The buttons along the back sleeve seam are not functional, so I could pop them off and re-position them after the sleeves were lengthened. 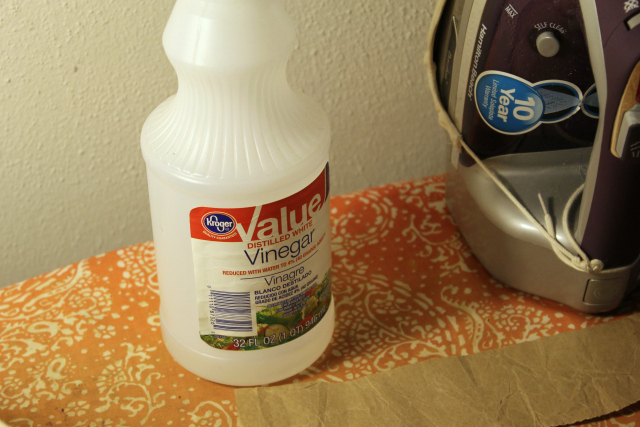 Many moons ago, Megan Nielsen blogged about steaming out a seemingly permanent crease on her denim Kelly skirt using a brown paper bag that she wet with a 50/50 mixture of white vinegar and water. 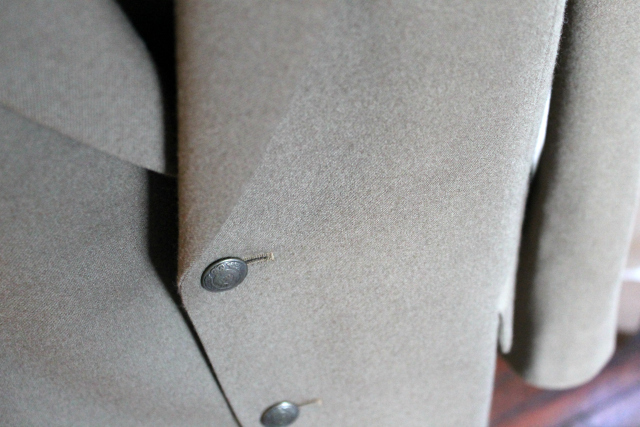 Luckily I was able to find her post again (HERE) and followed her lead to remove the hem creases on this suit jacket. I cut a scrap of brown packing paper from one of my far-too-frequent Wawak mail orders, then I dipped that in a mixture of white distilled vinegar and water. I placed the wet paper on top of the creased area, then steamed the daylights out of it. 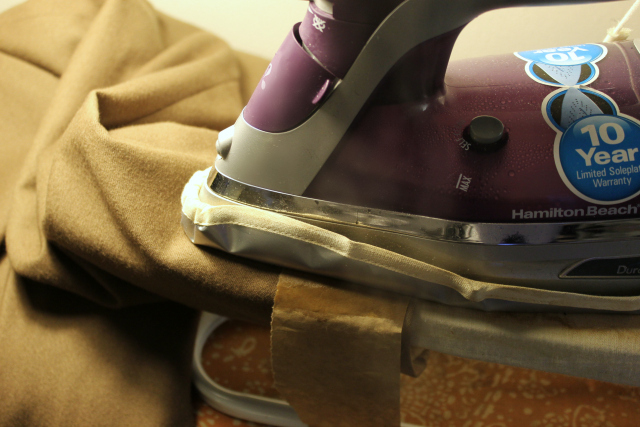 Held my iron there with constant steam for maybe 15 seconds until the paper was dry, then moved to the next section. Side note: I have a "one size fits all" iron shoe tied to my iron, in case you're wondering what that thing is. Helps prevent scorching and shine. Not bad! The garment does not smell like vinegar, though my sewing room and hands now do. I'll also note that the thinner packing paper worked better on the crease than when I tried this with a Trader Joe's paper bag, which is a bit thicker. That's all. Just wanted to share this tidbit in case you ever have to alter clothes for a tall guy (or gal). Have you tried this?